I know that some of you in the Atlanta area woke up to a very pleasant surprise this morning. I woke up thinking, my, I am sure the snow is not as bad as it was anticipated. I peep through my window, and what a mixed feeling of the sight that I beheld. Beautiful as it looked, I thought, wow, that means no driving out from the house today. 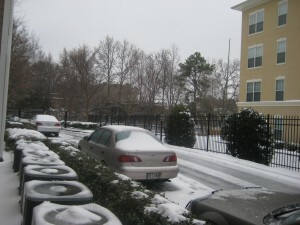 It took me a few more seconds to realize that we have over 3 inches of snow, now that’s a whole lot of snow in Atlanta. Consequently, schools and most businesses are shut down on a Monday and possibly will remain shut down the next day being Tuesday. The snow triggered lots of thoughts; what will I eat, hope I have enough water to last me, hope I got enough apples, gosh, my lemons are almost finished, what food do I have in the fridge, and on and on and on my memory frantically paced. Then my thought went to back in the days when I used to work in corporate America, how I would have been so unbelievably excited that it snowed and this is because with the snow, I will not, and shall not go in to work even if they dared to make me! I remembered how we, my work colleagues and I used to pray that it snowed, we would call each other up and ask if the other was going in to work, whew, thank God, those days are gone. And then it occurred to me, well Nina, now that you are running your own business as a company President, how do you feel about the news of snow coming down and disrupting your business plans and knowing that a lot of your employees will not come to work. Mmh, I thought, well, our feelings towards any situation depends on how the hat fits and from whose perspective the situation is viewed from. While I don’t regret any of my actions back in the day, I knew that now as a CEO, I will have to device a means to be safe, along with my team and still be productive. I believe that a company should have a heart and feel the pulse of their employees to a large extent. Anyway, snow or no snow, I was bent on having a Superfantastic great and productive day! So what did I do? After my morning devotion, I made some fresh “Morning Pick Me Up Juice,” one of my favorites, comprising of Grapefruit, lemon, ginger, apple with 1 cup of hot water and honey… mmmh yummy. I know that working from home will mean possible frequent trips to the fridge and pantry, so I armed myself with some almonds on my office desk and leftover some of the pickmeup juice for moments of trips to the refrigerator. I dressed up, casually and walked into my home office ready to take on my day. I made a list of some of the things I needed to accomplish my the end of today and with that, I started off with making some follow up phone calls, initiated some calls, returned emails, sent some out, checked on my team and some customers, took a trip to the fridge and back to the office. On to an important task – updates to the ninaijere.com website, I have got a week to finish this out. One of my phone calls was to a good girlfriend, Jenny, who whose birthday was this past Saturday, to celebrate a milestone in her years of existence, she took a trip with her hunky husband to a serene couples location up in the mountains somewhere I still don’t know as I write. She won’t tell where it is just yet because she wants it to be a surprise, to who? I asked, anyway – lol. To mark her 40th birthday, she is expecting loads of “I’s” as gift, by that she means; I-Pad, I-Mac, I-Pod but she said she doesn’t want I-love-U. To know Jenny is to love her, such an amazing friend and sister at that! Well, happy birthday and I love U! I go back to work as I saw that my day was almost far spent, revisited my list of to-do’s. All is going as planned, thank God. Procrastination ain’t got nothing on me. One of the decisions I made this year is to diligently overcome and fight procrastination. The fight is on, it is a conscious one and the feeling of accomplishment that comes with overcoming it is priceless. Time waits for no man, on its own time’s ticking and tocking, soon it’s time for lunch, and the question comes, whats it going to be for lunch. Had some frozen Halibut fish steak that had been defrosted, great idea! So I season it and placed them both on the steamer to cook. While the fish was cooking, I called up another good girlfriend, Elle, very knowledgeable and intelligent, I must say, for a brainstorming session as planning for Bloom 2011 is underway. Not long ago, she came back from Nigeria after working with a top telecommunication company in Nigeria as one of their Executives for an 1 hour plus, great use of time it was. Bloom 2010 was held in Atlanta, GA and it was a great success, stay tuned as we bring you Bloom 2011 both in the USA and internationally, in Nigeria. “Ding!” and the steamer is off, meaning the fish is cooked. Next thing I ask myself, what shall I eat with the fish? I had some vegetables and I decided to make some sauteed vegetable medley. Cut up my cabbage, zucchini, celery, red onions, fresh habanero pepper (gotta be hot!) along with 2 cloves of garlic. So with my pan heated up, a little bit of olive oil and in goes the onions, pepper and red onions. Letting it saute for a minute, the rest of the veges were in the pan, following was a pinch of salt, sprinkle of basil seasoning, pinch of curry and mix it all up… so I’m getting all excited about my lunch, I cannot wait to savor my home cooked Nina Cuisine. With soulful music by Jill Scott playing mellow, I ravish my lunch, and oh, did it taste good. I truly wanted to go for a 2nd helping, but I snapped out of it so fast remembering one of the rules of healthy eating being, “no 2nd helpings.” It always works, come to think of it, I snapped out of that craving as fast as I thought about it remembering this rule. Now that tells me that sometimes the cravings we have for food are just in the mind and some of it is gluttony.